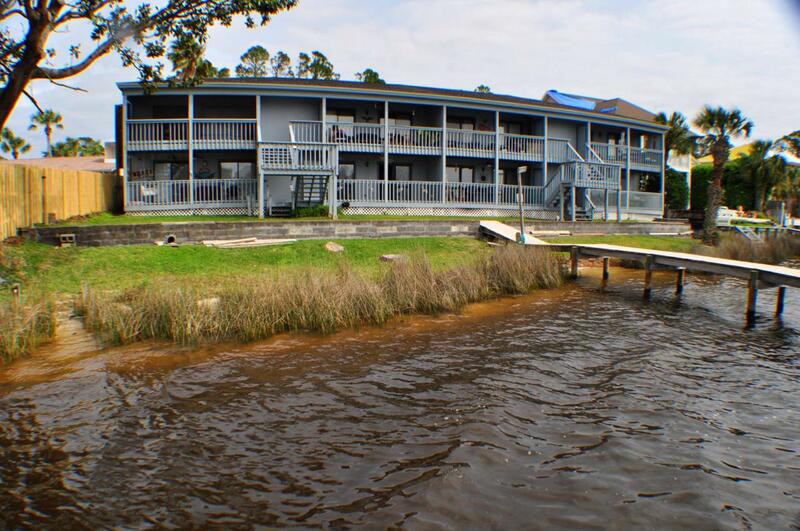 Great waterfront condo on Grand Lagoon with a boat slip with lift for patio/pontoon boat. The 2BR/2BA unit has been completely updated in the last two years. The kitchen was completely renovated with all new cabinets, granite countertops, a scratch resistant sink, stainless steel appliances and a beverage cooler. The sellers added wood flooring to the living area and new base and crown moldings, fresh paint throughout, and both baths were upgraded with some custom tile and a ''fish'' bowl sink in the guest bath. There is a covered deck off the back that overlooks the boat dock and the lagoon and the dock includes a sitting area ideal for afternoon libations with the neighbors. This unit is on the first floor and the complex is low-density. Very quiet and ideal for your second home!All info is approx. and must be verified by Buyers if important. The unit did not receive any hurricane damage however the roof on the complex was recently replaced.